My granddaughter who just turned 5, loves the earings. They are precious. They are smaller then I hoped. She loves them, so they are a keeper. Service was great! I will definitely be ordering again from Tiny blessings. These earrings are very pretty and well made. They are small and light with secure back screw on latches. It was very easy easy to order them on the website. Very quick shipping. We purchased these for our 6 year old daughter, they fit her nicely and are a nice step up regular studs. 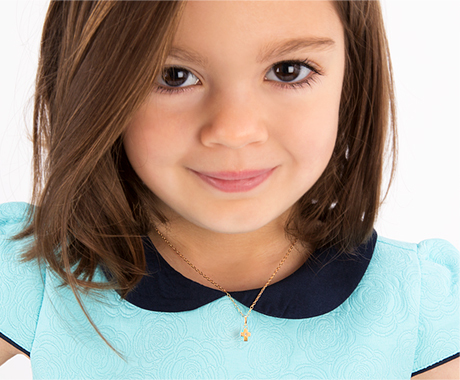 Beautiful jewelry for a young child. I ordered the pink heart screw back earrings for my 2 year old granddaughter. They look beautiful on her ears. They are well made and perfectly sized for a toddler. Again, so pretty and delicate, perfect for the little ears of my almost 3 yr old granddaughter. She is wearing her birthday butterflies now, and will look lovely in these pink sparklers! Great service, packaging, stones, and backs - well made! We have this product for a while so I am comfortable to write an honest review. It is a beautiful and well made earring and the best part is that it is so secured on her ears. My daughter has lost couple pairs of earrings due to the loose backings, but we have no issue with this pair. Love it. The earrings are beautifully made, fit nicely, post was solid. We got lots of compliments for it! Perfect tiny earrings for my 2 year old niece!!! Beautiful earrings and the size is perfect! I received the package in the mail and couldn't believe when I opened it...the presentation was beautiful: a bow around the box, a certificate, and small pouch all wrapped so nicely. The earrings are really pretty. My 2-year old daughter was so happy and smiling when she saw the heart earrings. She can't wait to wear them on Valentine's Day! Thanks so much for putting such careful thought into how it's wrapped. I was expecting to receive a box with earrings inside but not expecting such a pretty presentation. Thank you! I bought these earrings for my granddaughter who is 9 months old. She had her ears pierced in September and I wanted to get her some small earrings with secure backs that wouldn't hurt her. These are perfect and the backs are very secure. Purchased these for my great nieces for Christmas. They loved them. Loved the sparkle! Extremely happy with my purchase!!!!! I couldn't be happier with the earrings I ordered for my daughter. They arrived quickly and were packaged with care. I cannot recommend Tiny Blessings enough!! These Pink CZ Heart Earrings sparkle and look so beautiful on my Granddaughter's ears. Very pleased with my purchase. These Pink CZ Heart Earrings sparkle and look so beautiful on my Granddaughter. I received the earrings in a timely manner. The box was marked fragile, and the packaging was amazing. The receipt, a certificate, the box with the earrings, and a cute jewlery bag was inside. The earrings look a lot nicer in person. I am extremely satisfied with this order. The earrings look a lot more expensive then what I paid for them. I will from now on be buying my daughters earrings from this company. Got these earrings for my one year old. I love them they fit perfect! I bought these for my daughter. She has really sensitive ears and can't wear anything "cheap." They have been on her ears for about two weeks and she had had no problems! And they look so pretty! She loves them and so do I! Win win! The earrings arrived very quickly; they shipped the same day even though I did not request to expedite the shipping. When I opened them, they were even more gorgeous than I expected. My daughter is 7 months, this was her 1st Valentine's Day present :) Perfect size for her little ears, they're not "small" but perfect size for a little bling and boy, do they sparkle!! I took a chance ordering online and I am SO glad I did! I usually buy all my daughters jewelry from well known jewelry stores, but I will buy from Tiny Blessings from now on. I love the backs of these, they are solid round screw on backs, compared to what my daughters other earrings had the screw on backs that are open which are so hard to even hold because they are so tiny. Everything about this site and earrings is 5 stars! Can't wait to purchase more for my princess! These earrings are beautiful on my granddaughter and are great quality .. I will be a regular customer ty. These earrings are gorgeous! They are pretty and the perfect size for a baby or little girl. These are the third lot of earrings I have bought from Tiny Blessings and I am still very happy. Love screw backs for little ones as I have never had any lost earrings. Perfect for my little grand daughter! I ordered these little pink hearts for my grand daughter and she loves them. She has only had pierced ears for a few months so I wanted something with at least 14K gold. It was also important to have screw on backs as she wears them to bed and I didn't want the backs falling off. These are just what I was looking for, and am very pleased with my purchase. They arrived promptly as well.